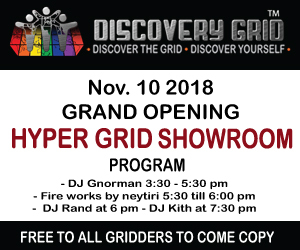 The results of the 2012 Hypergrid Business grid survey are in, with a record 644 ratings submitted, up from 459 in last year’s survey and 194 in 2010, the first year the survey was conducted. The vast majority of respondents — 87.4 percent — said they would “absolutely” recommend their grid to others, roughly the same as last year’s 87.7 percent and 2010’s 89.5 percent. Lost Paradise was the surprise leader when it came to overall ranking. Counting “Excellent” as a 5, and “Very good” as 4, the grid received almost perfect scores from 11 respondents in every category — and an absolutely perfect score for support. The medium-sized grid has 259 regions and just 59 active monthly users last month. In fact, the grid was so small that it wasn’t even listed as one of the default choices in the survey — each of the respondents wrote it in. Last year, another small grid pulled off a similar write-in upset — Island Oasis — and quickly grew to become a top-ten grid by popularity. However, it remains to be seen whether Lost Paradise will be able to maintain its level of support and service. 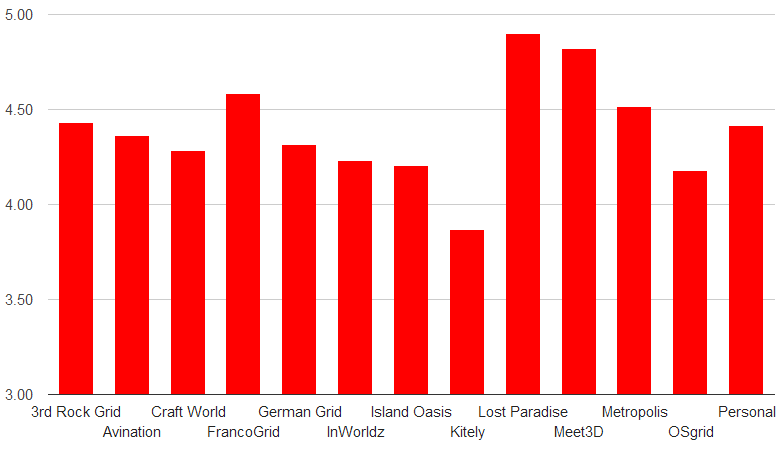 In this year’s survey, Island Oasis dropped to the bottom of the ratings, tying with OSgrid for last place in the overall rating, and ranking dead last in technology. 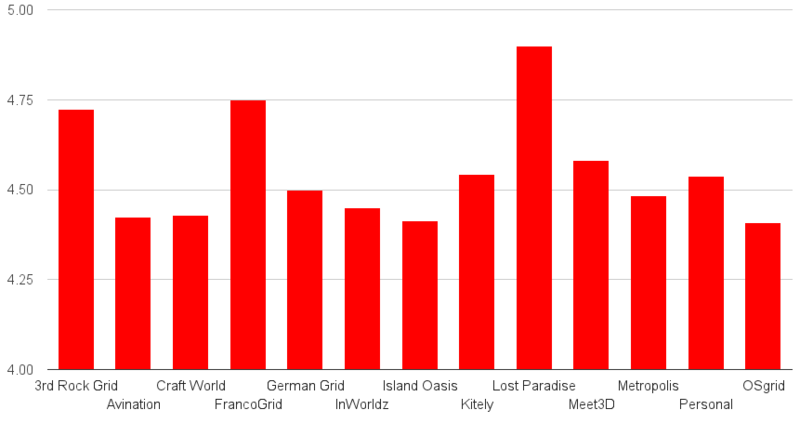 The French-language non-profit grid FrancoGrid was second in the overall rankings, followed by the mid-sized commercial grid 3rd Rock Grid, then Brazilian social grid Meet3D, then the cloud-based commercial grid Kitely. Personal grids came in sixth, then German Grid, Metropolis, InWorldz, Craft World, Avination, and OSgrid and Island Oasis. Keep in mind, though, that the scores all ranged between “Very good” and “Excellent” — a good showing for any grid. On the other hand, if someone really didn’t like a particular grid, they wouldn’t stay there and consider it their primary grid, and wouldn’t have rated it at all. 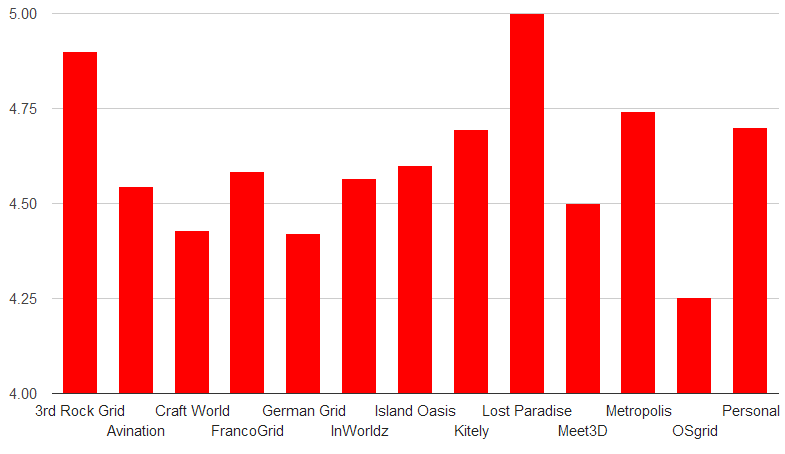 Lost Paradise led the charts in terms of its community, followed by 3rd Rock Grid, Metropolis, FrancoGrid, Island Oasis, Craft, German Grid, InWorldz and Meet3D. 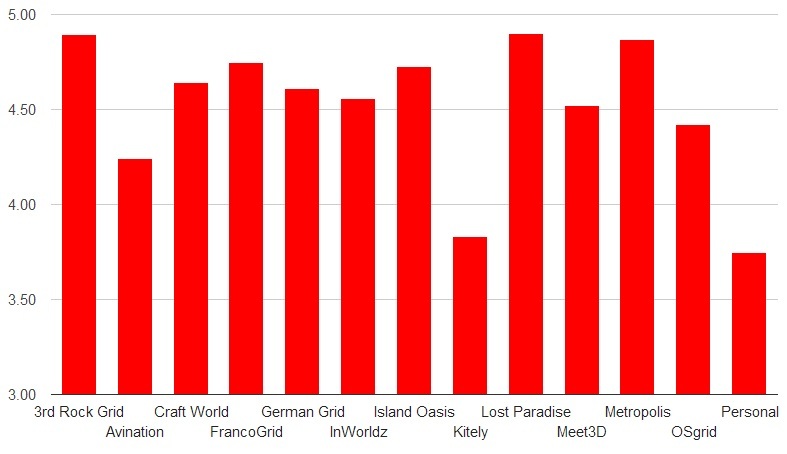 OSgrid, a non-profit which allows anyone to connect home-based regions, was in tenth place, followed by the commercial grid Avination, Kitely, and personal grids. Kitely, unlike other commercial grids, has no dedicated community-building program. There is no official welcome region or freebie store, no greeters to welcome new residents, no promotion of grid-wide events. This has recently begun to change with the formation of the Kitely Mentors Group and Kitely’s Public Worlds page. Personal grids, not surprisingly, ranked last on the community metric. Lost Paradise ranked first in content, followed by Meet3D, FrancoGrid, Metropolis, 3rd Rock Grid, personal grids, Avination, German Grid, Craft World, InWorldz, Island Oasis, OSgrid, and Kitely. It is likely that Meet3D did well because of its concert series, backed by large real-world business partners. OSgrid’s twelth-place showing is no surprise, since the grid has no in-world economy to speak of, and Kitely only recently launched its in-world currency. However, it’s surprising that both Avination and InWorldz ranked below “personal grid” in terms of content. They are the two most popular commercial grids, and are known for their in-world merchants and events. Lost Paradise led the way in terms of support, with the only perfect score. However, good support is much easier to achieve on a grid with just 59 active monthly users — as opposed to, say, InWorldz with its 6,000-plus active users. In second place, we had 3rd Rock Grid with a nearly-perfect ranking, followed by Metropolis, personal grids, Kitely, Island Oasis, FrancoGrid, InWorldz, Avination, Meet3D, Craft World, German Grid, and OSgrid. Lost Paradise was in first place for technology, and Island Oasis in last place — possibly an indication of how difficult it is for a startup grid to do scaling right. Kitely was in second place in technology. The grid runs its regions on the Amazon cloud, and each region — or megaregion — can handle up to 100 simultaneous avatars and 100,000 prims. The cloud hosting not only allows for a dramatically lower cost structure than available on other grids, but also allows Kitely to scale indefinitely. Kitely also uses the latest version of OpenSim, which supports mesh, media-on-a-prim, NPCs, and other new features. In addition, Kitely has built its own Web-based management system which easily allows users to create regions, quickly upload or save OAR files, restrict access to particular Facebook or Twitter groups, and install and launch viewers for new users. Kitely is also known for its fast and personal support from its founders via its Get Satisfaction page, and also regularly donates code back to the OpenSimulator project. It is currently, hands-down, the most technologically advanced of all the OpenSim grids. Metropolis was in third place for technology, followed by 3rd Rock Grid, Meet3D, Avination, German Grid, FrancoGrid, personal grids, Craft, OSgrid, InWorldz and, finally, Island Oasis. InWorldz may have suffered a bit because it is still working on rolling out its own physics engine — other grids just use the standard physics engine that comes with the latest version of OpenSim. InWorldz is also missing mesh and other features available in recent OpenSim releases. SpotON 3D should have been ranked for its technology, with its innovative, browser-based grid viewer, as well as other patent-pending technologies. 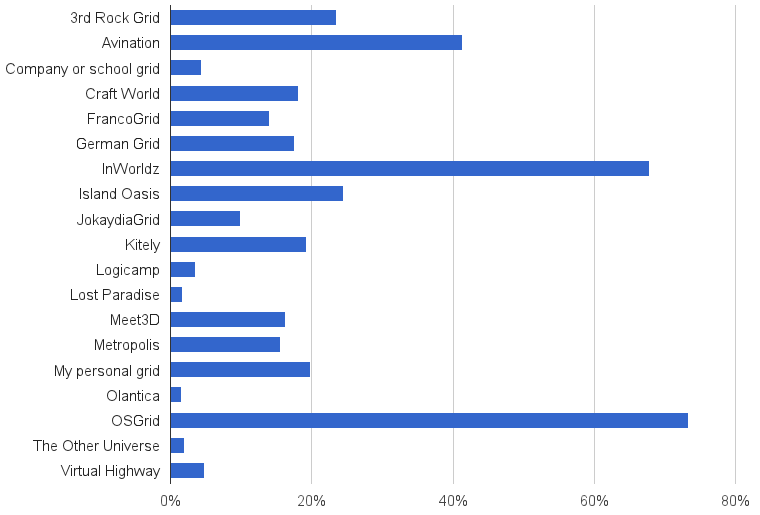 However, not a single respondent chose SpotON 3D as their primary grid — and only four respondents wrote in the grid under grids they have visited. 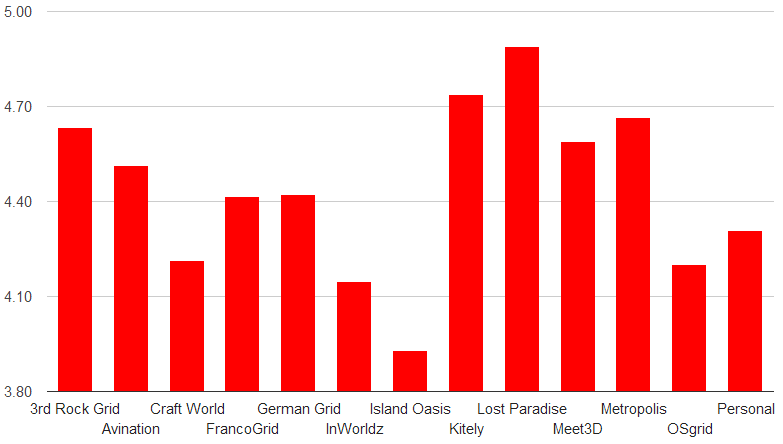 We added up all the grids that folks either picked as their primary grids, or that they said they’d visited, and OSgrid was the most visited grid, with 472 out of 644 — 73 percent — of all respondents saying they had been there. InWorldz was in second place, with 68 percent, Avination third with 41 percent, Island Oasis fourth with 25 percent, and 3rd Rock Grid fifth with 23 percent. Personal grids came in sixth, with 20 percent of all respondents either picking it as their primary grid or saying they had visited one. Kitely was next with 19 percent, followed by Craft, German Grid, Meet3D, Metropolis, FrancoGrid, JokaydiaGrid, Virtual Highway, a company or school grid, Logicamp, The Other Universe, Lost Paradise, and Olantica. Several grid were mentioned less than ten times each, including Dorena’s World, MOSES, AviWorlds, New World Grid, Grid Nirvana, SpotON 3D, Haven, Speculoos, What Virtual World, Dreamnation, IceGrid, Littlefield Grid, NexXtLife (also known as The Other Universe), OpenLife (now 3Dmee), Utopie Grid, Created Worlds, FleepGrid, Gay Nations, Hippy Grid, Hyperica, Infinite Grid, Misfit’s Folly, Moonglow, MyOpenGrid, Neuland, New Genres Grid, Pseudospace (no longer active), ReactionGrid (also closed, company focusing on Jibe), SirinHGpole, Tertiary Grid, AngelFire Grid, Twisted Sky, UFS Grid, Valhalla Virtual, Virtyou, and Your Alternative Life. There were 62 grids total that our respondents mentioned as having visited. The number of grids chosen as primary grids was smaller, with just 27 grids named, plus company, school and personal grids. 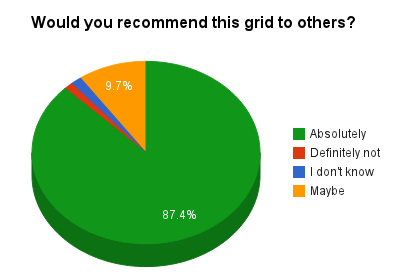 InWorldz was chosen by 186 respondents, or 29 percent, as their primary grid. OSgrid was second with 144 respondents, or 22 percent. Meet3D was a distant third, with 47 ratings, or 7 percent of all respondents. 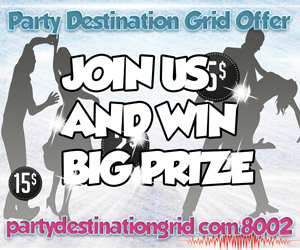 The following grids were chosen as primary by less than 10 respondents each: AviWorlds, Dorena’s World, Dreamnation, Grid Nirvana, Haven, Ice Grid, JokaydiaGrid, MOSES, Neuland, New Genres Grid, Olantica, Valhalla Virtual, Virtual Highway, and private company and school grids. We didn’t factor in their results because the small number of votes meant that their ratings were the least reliable. A couple of the grids mentioned were completely new to us, including Olantica, What Virtual World, Moonglow, and Utopie Grid. We couldn’t find links to the latter two grids. Some 200 respondents wrote in comments, some very detailed, about their experiences on the grid. We’re reprinting the most representative comments here. Please keep in mind that the comments were submitted with the expectation of anonymity, so might express views which might not be expressed otherwise.